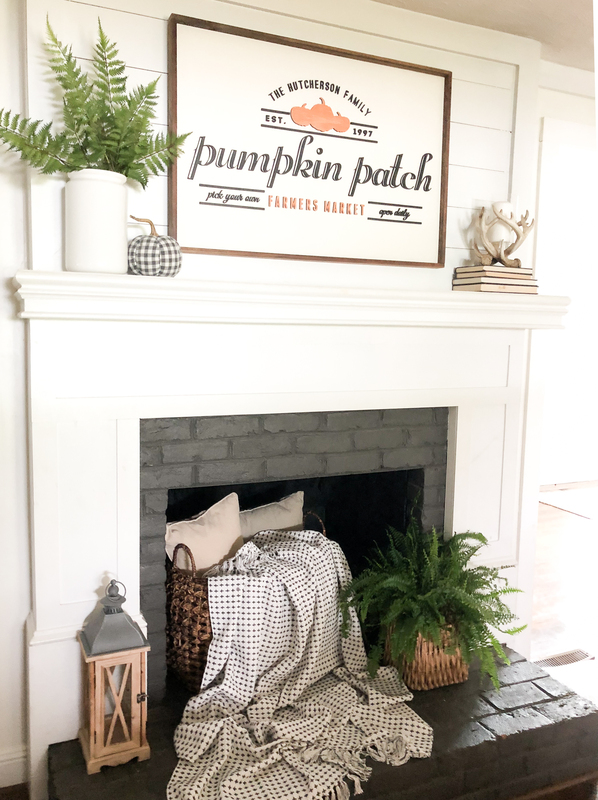 This past weekend, I added a few things to our den to warm it up for fall and make it feel real cozy. Although the temperatures here in Kentucky are not as low as I wish they were…we are still in the 80’s…I know the temperatures will begin falling soon, and I will be ready! haha! 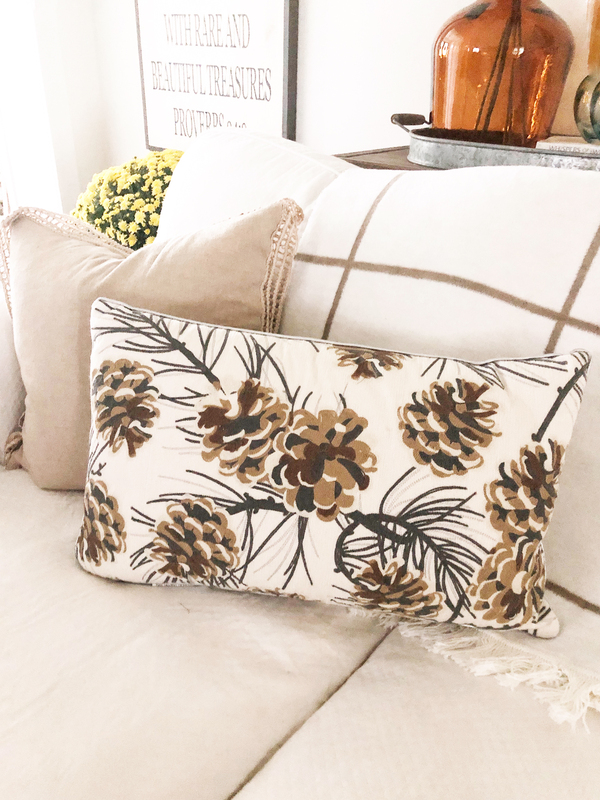 When I saw the pine cone pillows at Marshall’s, I knew that I would want to use them in our den. 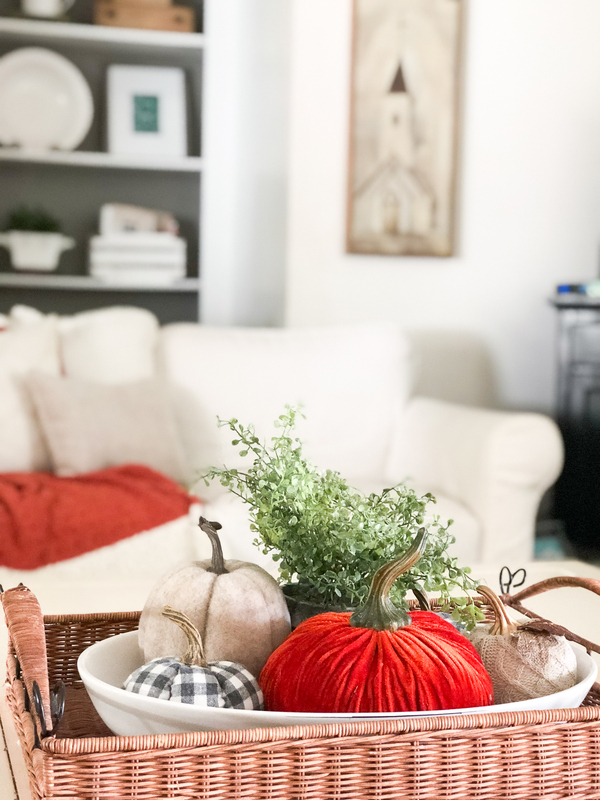 They are perfect for fall, but I can use them in my Christmas decor as well. Behind my couch, I have a sofa table that Cy made. 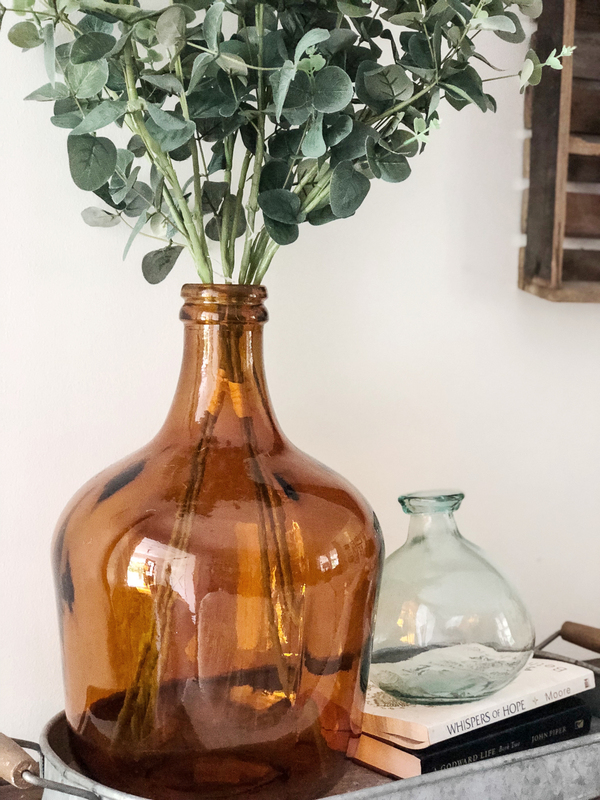 I have been loving the amber glass jar trend, so when I saw this large amber vase at Marshall’s, I got it immediately. It definitely warms up the space! I placed some eucalyptus leaves in the amber jar, and I love those two colors together. On the wall to the left of my couch is one of my favorite signs that I have had for years. I got it from Between You and Me Signs. 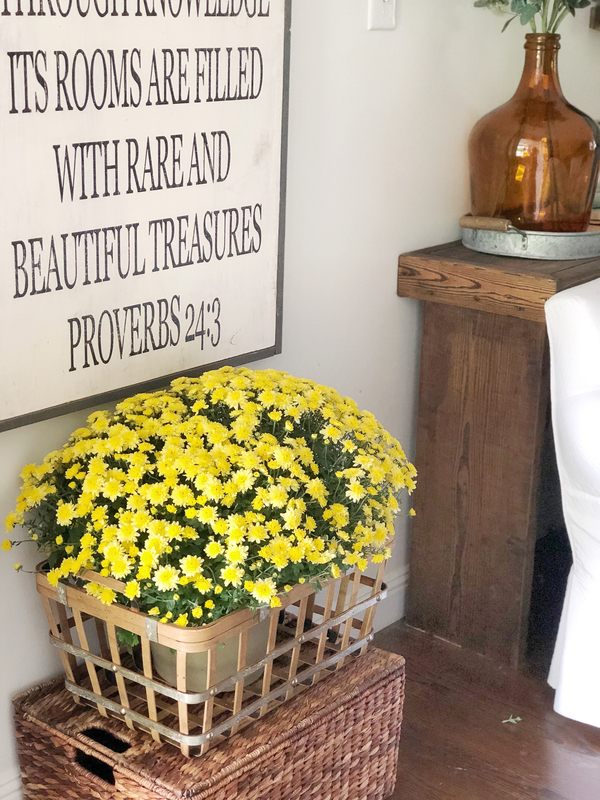 I placed a yellow mum in a basket (and then on top of another basket,) to add a touch of fall right when you walk in our front door. 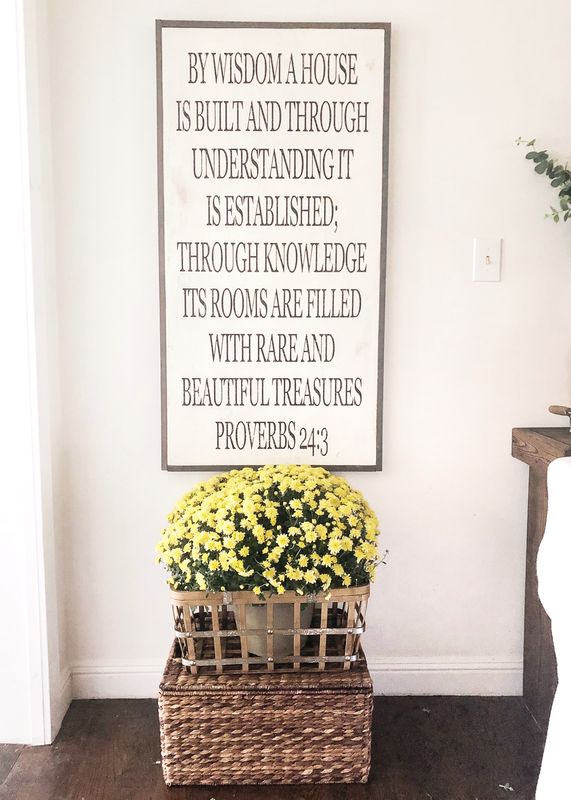 Yellow mums are my favorite. Do you have a favorite color of mums? In the picture below, you can see where are front doors are in comparison to my den. It looks like there is a lot of light in this space, but y’all, our den is the darkest room in our house! Besides the doors, there are only two windows on the other side of the room, and they look out to our covered back patio. Because the back patio is covered, we do not get much light in our den from those windows either. So it is really hard to photograph this space. I had to open my front doors to try and get more light in the room. It had been raining from the leftovers of Tropical Florence the day I took the pictures, and it was actually dark and gloomy that day. The other side of the room was so dark, that I never could get good pictures to share with you. And I had to really bump up the exposure on these pictures to make my den appear to have more light, but it made my photos really grainy. I’m sure I could have made it look better if I was a better photographer, but that is not my gift. haha! Anyway, let’s move on to our fireplace! 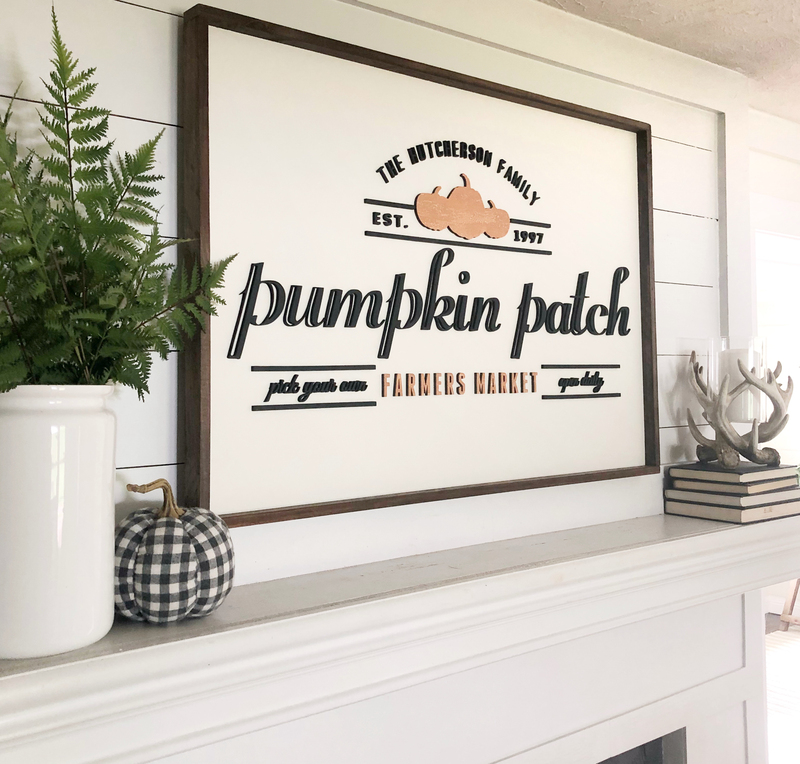 I shared our new personalized fall sign with you a couple of weeks ago. It’s from Two Daughter’s Heirlooms, and you can use coupon code “heart10” for 10% anything in their Etsy shop until 9/22. Click HERE for more info. 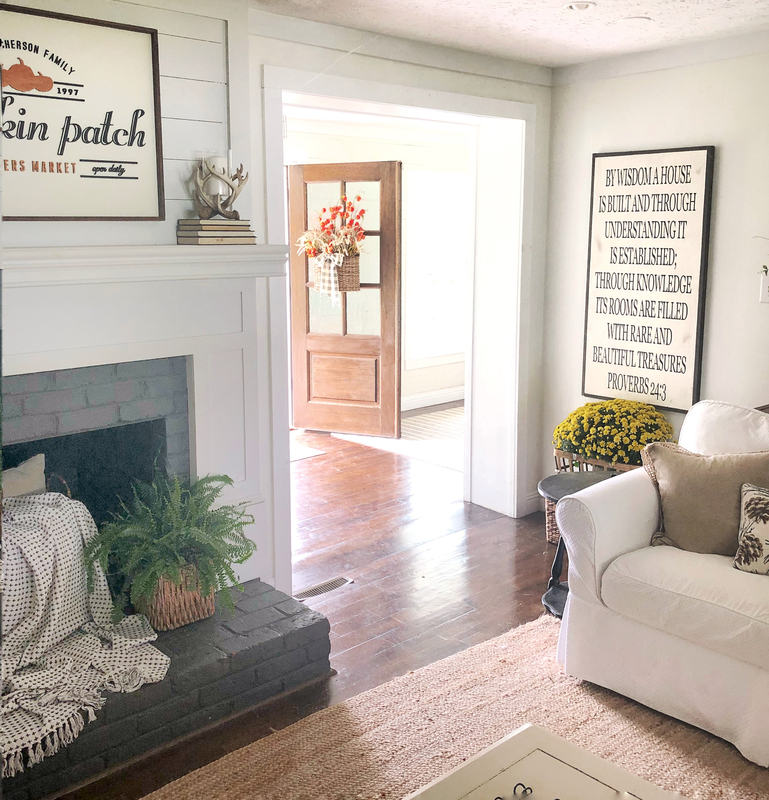 It is such a beautifully hand-crafted sign, and I love how it looks above our fireplace! 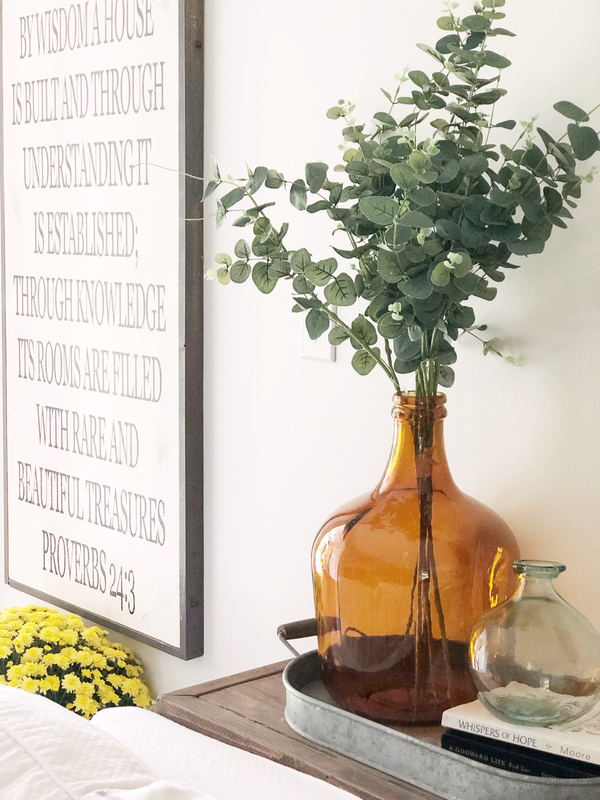 I don’t have much decor on my mantle because to me, the sign it pretty enough all on it’s own. Since our fireplace is not a working fireplace, I usually decorate the hearth with seasonal decor. Recently, I stuck a large basket in there that holds all of our extra pillows and blankets. It is actually functional decor. 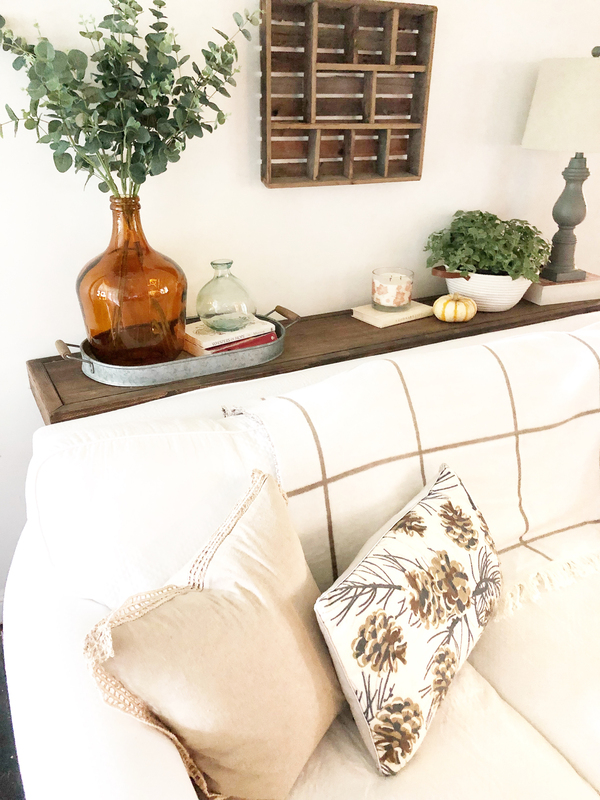 I have it styled for this picture, but my kids are always grabbing pillows out of this basket to lay on when watching tv or hanging out in the den. I also added a lantern and a fern for some more depth and color on the hearth. Lastly, I added some velvet and cloth pumpkins in a tray on our coffee table. 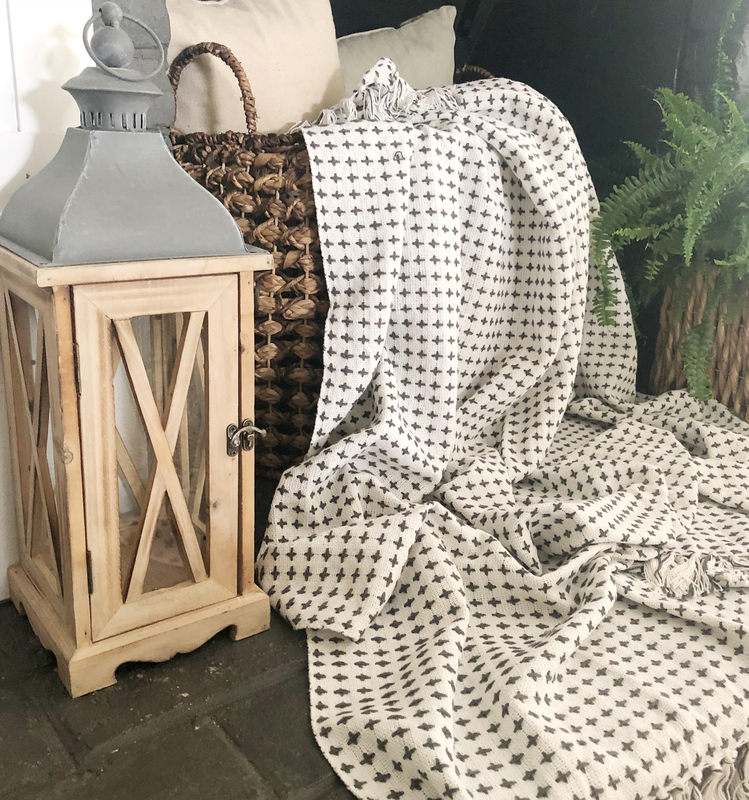 I love that little black and white gingham pumpkin! And that’s it! 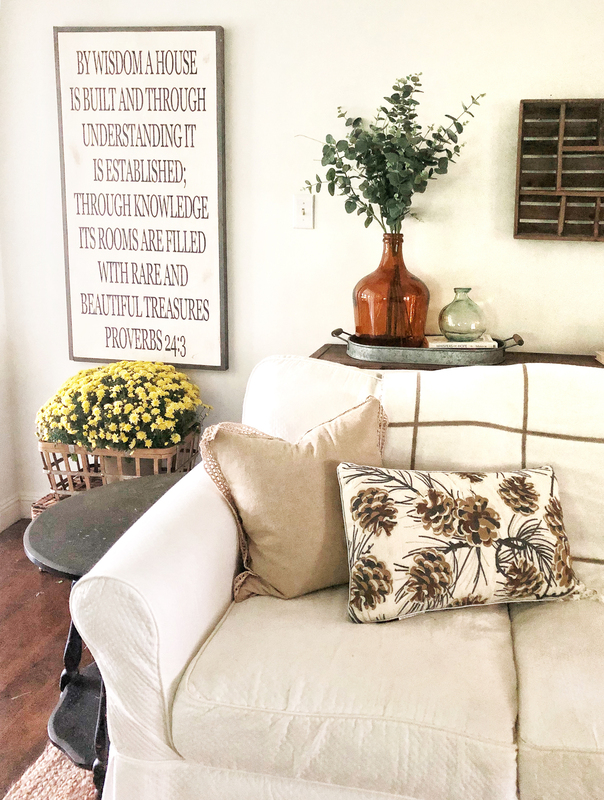 Although I didn’t add a ton of fall decor, our den feels extra cozy. My kids even commented on how cozy it felt as I was decorating! That made my heart happy. Now I just need those temperatures drop, and I need to fix a big pot of chili, and fall will be knocking on my front door! yay!! 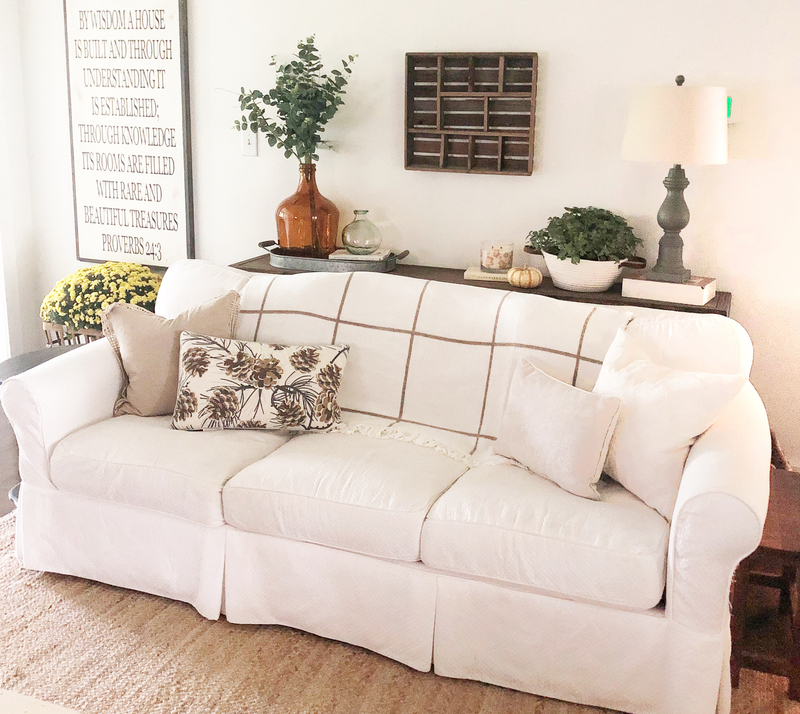 I shared my den as part of the Seasons of Home tour hosted by sweet Kristen from Ella Claire Inspired. 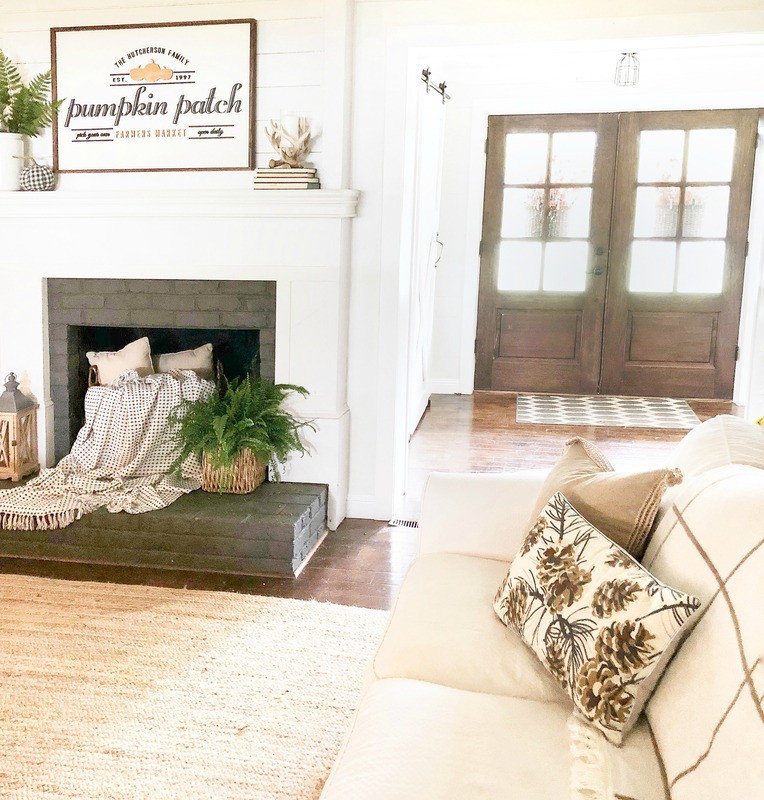 So go grab a pumpkin spice latte, cozy up on the couch, and check out my precious blog friends’ beautiful fall living room spaces by clicking on the links below. I’m sure you meant Pine cone pillows and not acorn. I really like the warm browns, especially the jar. I love yellow mums also. So cozy! I’ve not seen the amber colored jars…makes me want to check out Marshalls in my area to see if they have them!